Great story, hard to believe the outcome which made it that more entrancing. Amazing what can happen if you open your eyes. Loved the movie. Excellent acting. Shows the ignorance of the KKK and everyone alike. Should be seen by everyone. Great life lessons. Good chemistry with the cast overall. Good story and a great ending. A true story told brilliantly. Interesting. Laughed and cried. Unfortunately there are people who are racist and strongly believe in segregation. This whole idea of racism is senseless. We can’t change what race we are. Although some people try, but the point is, we are what God created us to be and we should love who we are and love others as well. What a true story of courage and justice, Great movie to warm your heart and make you think. Is this still going on today, is this acceptable, can we be of one human race? Open your heart to yourself and feel the pain. Great story. 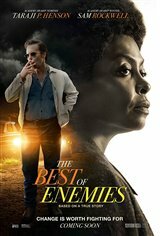 Love Taraji Henson and Sam Rockwell, great acting. Good family movie with a lesson to learn.